Lacikonyha Magyarorszák Kft. company established in 1998 is one of the major producers of spices in the Hungarian market. It manages three brands: Cavalcad, Lacikonyha and Gastro Maestro. Its offer is addressed to the retail customer and gastronomy. The company offers a wide range of products such as uniform spices, spice blends, as well as, soups and food additives. The offer includes products, which meet the flavours known and popular in Europe, as well as, those which are characteristic for the Hungarian cuisine. The purchase of the Hungarian firm is the result of the consistent development policy of the company. After the finalisation of this investment, Prymat Group employs 893 people in total and the consolidated turnover, according to the projections, will amount to 515 million PLN in 2017. The Ízmester brand is the world of spices appreciated for their original and rich taste and aroma. The brand’s offer includes mostly homogeneous spices: high quality aromatic herbs, spicy peppers and exotic spices. Ízmester products also include specialist spice mixtures and salad dressings to flavour your favourite dishes quickly and guarantee a reproducible taste and culinary effect. The product range is supplemented with processed vegetable products such as: cucumbers, horseradish, dried tomatoes, mushrooms and onions. The product range is made up based on traditional flavours typical for Hungarian cuisine as well as meals popular in the entire European cuisine. The Lacikonyha brand is associated with high quality products at attractive prices. 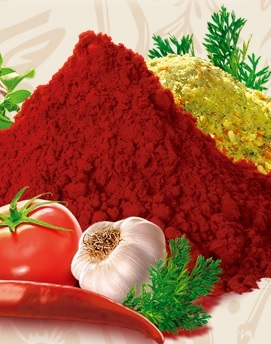 Paprika, for which Hungarian cuisine is so famous around the world, is an important category in the product range of Lacikonyha. The taste, aroma and colour of this most popular Hungarian spice is the secret of Hungarian cuisine. Our Hungarian paprika means the highest quality and guaranteed taste in the broad range of packaging sizes, so that every consumer can find a suitable option. The product range also includes paprikas from different parts of the world, which makes our brand a true specialist in this category. Soups are another important category in the Lacikonyha brand – the offer includes popular options of instant soups perfectly matching the tastes of Hungarian customers. Lacikonyha is also a universal spice that allows for simple flavouring of prepared dishes. It allows for the obtaining of an intense taste and reproducible culinary effect. The Lacikonyha range also includes the economical Cavalcad brand offering a universal seasoning. Thanks to it, you can prepare delicious homemade dishes with an intense vegetable flavour in a simple and quick way. It is a product at an attractive price while maintaining high quality. Cavalcad spices are perfect for very many dishes – soups, sauces, stews, meat, fish and vegetable dishes.